Panathinaikos has a remarkable tradition in the athletics, cycling, shooting, fencing and boxing departments. It has produced numerous athletes; World champions and European champions, winners at the Olympic, Mediterranean and Balkan Games. Greece national football team that participated in the Inter-Allied Games in Paris. There, he collected informations also about basketball and volleyball (sports unknown then in Greece) and after his return to Athens, started his efforts on creating new teams for the club. In 1924, the club took its final and current name "Panathinaikos Athlitikos Omilos (PAO)" (Panathenaic Athletic Club), from now on a multi-sports club. During the next decades, with main contributor Apostolos Nikolaidis (considered Patriarch of the club), Panathinaikos not only will create teams almost in every sport, but they will be consecutive champions for many years in most of them. Olympic Indoor Hall during a Panathinaikos B.C. Panathinaikos is the only Greek that has reached the UEFA Champions League final (in 1971) and semi-finals (in 1985 and 1996), such as the Intercontinental Cup final. 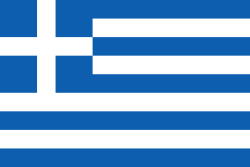 Greece and one of the most successful in Europe, with six European championships and one Intercontinental Cup. Panathinaikos men's volleyball The volleyball department was founded in 1919. it is one of the oldest and most successful volleyball teams in Greece. Panathinaikos women's basketball The department was founded in 1937, the first in the country. Panathinaikos women's volleyball The department was founded in 1969 and is the women's volleyball team with more trophies in Greece. The athletics department was founded in 1919. The first athletes were the football players of the club. Panathinaikos cycling Founded in 1928, it is one of the most successful departments of Panathinaikos. Panathinaikos table tennis The department was founded in 1924 by Nikos Mantzaroglou. Panathinaikos boxing It was founded in 1912 by John Cyril Campbell, the coach of the football team. Panathinaikos fencing Just like the boxing department, it was founded in 1912 by John Cyril Campbell, the coach of the football team. Panathinaikos friends) is the other major supporters organization. Panathinaikos F.C. Panathinaikos AO presidents List of Panathinaikos F.C. Greece championships". RSSSF. Retrieved 12 April 2012. ^ a b " Panathinaikos F.C. Panathinaikos F.C. trophies". pao.gr. Archived from the original on 19 January 2016. Retrieved 12 April 2012. ^ a b " Panathinaikos F.C.